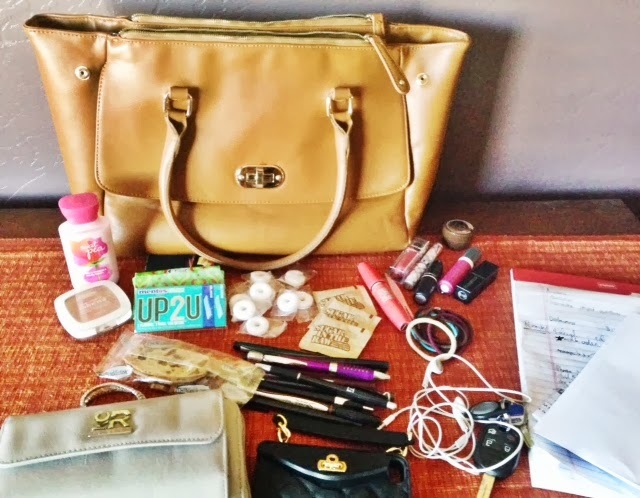 I’ve seen the ‘What’s in My Bag’ concept as a video within the beauty and fashionista vlogging world. 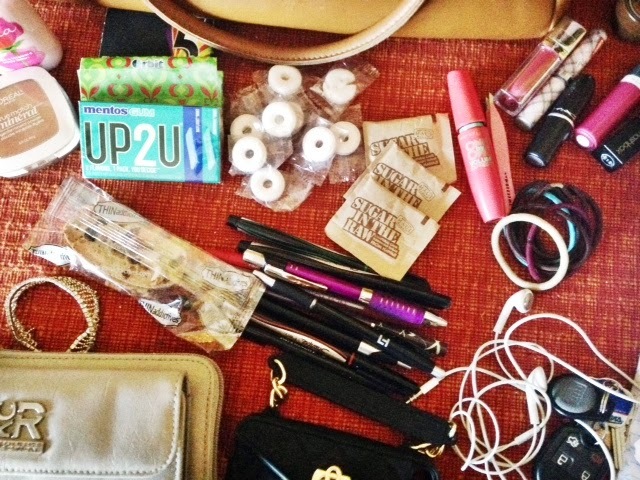 I thought I would do a blog post on what’s in my bag. It may not be too exciting, but still a little peek into what I carry in this large bag of mine. 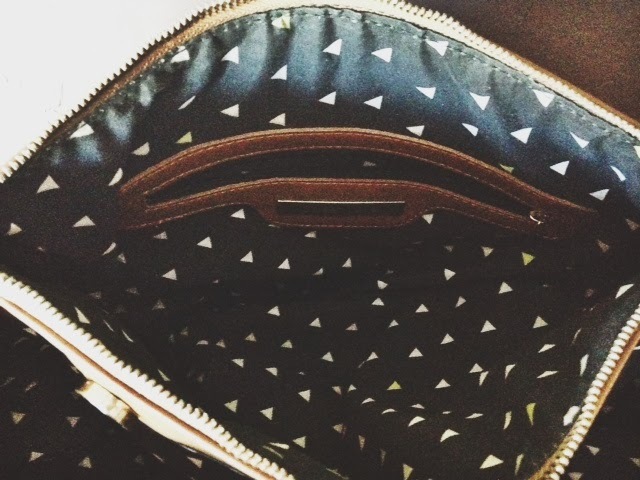 The inside of the bag is even better…with this cute triangle design. I got it at Francesca’s. They have a lot of cute, colored bags but they always have some neutrals as well. 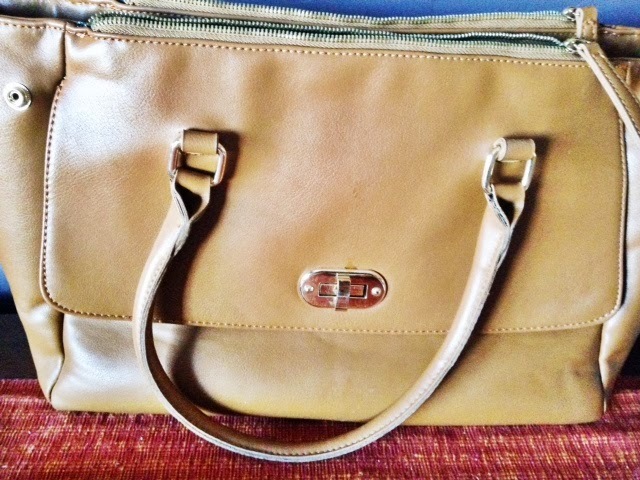 Right now they have some handbags on sale for $19.98 and up-go check it out! Wallet: My Kenneth Cole Reaction wallet was a Christmas or birthday present (I can’t remember which) from a dear family friend a few years ago. It hasn’t gotten much use, but when I got this bag I ended up putting my cards and receipts in this wallet. It doesn’t match, but hey- I like to live life on the edge. Fresh Breath Products: Apparently I carry three different packs of gum and various Lifesaver mints. Fresh breath for me! Headphones: I need these every day and everywhere. How else can I enjoy music and listening to vloggers? Pursecase: I posted about this little guy in a separate blog post here. 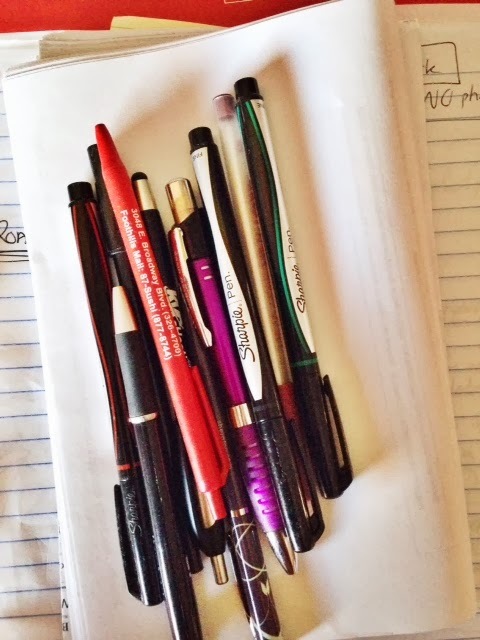 Pens and Notebook: I’m really not sure why I have so many pens in my purse. Just in case there’s ever a pen shortage, I got you covered. Also, my work notebook takes up a large portion of the purse. I’ve got hair ties for days so in case I lose one, I have another five. I’ve got my L’Oreal True Match Mineral Powder just in case I need to get rid of the shine in the middle of the day. I’ve got several lip products, a Bath & Body Works lotion (given to me as a Christmas present from my boss), my Tweezerman tweezers and a mascara. 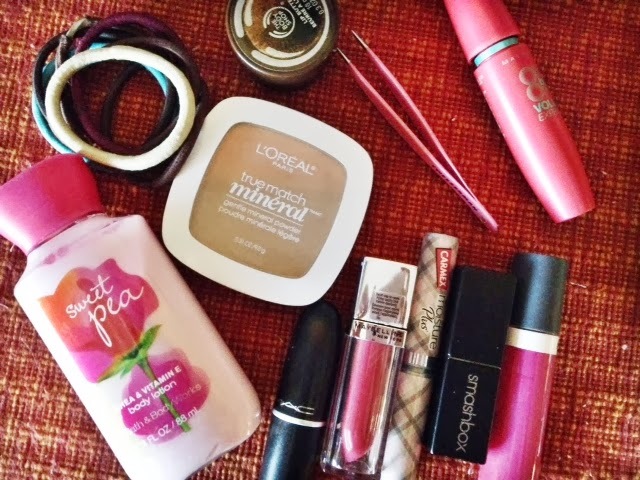 All of these are needed regularly and in case of serious make-up emergency. Lip Products: This is a big problem. I’ll use one lipstick once in a week, and then just leave it in my bag for the rest of eternity. The next time I need it, I can’t find it in my insanely large bag. We are doing pretty good right now for only having 6 lip products. Surprisingly, this doesn’t seem too crazy granted I cleaned out my purse about a month ago. I just have to make sure I don’t end up with 25 lip products in this bad boy. Now tell me, what’s in your bag?